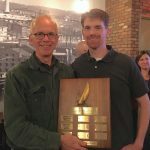 Scow Fleet Captain Jack Sheehan won the 2019 PRSA fall scow racing series and Scow Race Director Stew Harris won the spring series. The two scow sailors got their names on a plaque at the annual Potomac River Sailing Association soiree, Nov. 15 at the Heavy Seas in Arlington. The PRSA also awarded Sheehan and Harris with the Nabeel Alsalem Award for fleet development. The scow fleet has grown to six I20s, one M scow and one MC Scow. Previous PostEastern Championship Sept. 29Next PostFor Sale: ’87 Johnson I20-Sold!